Are you looking for an accessible and sunny destination in Europe? You found it! Tenerife Island is a perfect place for wheelchair users. While the Canary Islands belong to Spain, they are geographically close to Northern Africa. With year-round mild temperatures, Tenerife attracts millions of tourists each year. The biggest of the seven Canary Islands offers many wheelchair-accessible spots. This accessibility guide to Tenerife in a wheelchair will give you an idea of the island’s countless things to do for disabled visitors. See for yourself what I discovered during my recent trip to accessible Tenerife! The general wheelchair accessibility of Tenerife has improved remarkably since my last visit in 2009. Los Cristianos and Playa de las Americas surely are still the hotspots for disabled visitors. Costa Adeje is the most recent resort area with lots of newly constructed, modern hotel resorts. The Municipality of Arona won various prices for its efforts in making Arona wheelchair-accessible. However, also other parts of Tenerife have become very wheelchair-friendly, as you can see in the list of accessible spots further below. Sidewalks are globally in good condition. There are curb cuts, ramps and easy to find handicap parking lots. Two international airports serve Tenerife, Tenerife Sur Airport (IATA: TFS) in the south and Tenerife Norte Airport (IATA: code TFN) in the north of the island. The special assistance service for disabled passengers is well-organized in both airports. It goes without saying that both airports are entirely wheelchair-accessible. Wheelchair users have several options to get from the airport to the hotel and around Tenerife. Companies like LeRo, Orange Bus, and Active Mobility Tenerife offer specialized wheelchair-accessible transportation from the airports to the hotel. LeRo also offers excursions in adapted vans. I used LeRo in 2008 and 2009. Official Taxi Tenerife has a fleet of wheelchair-accessible taxis all over Tenerife. The service comes with no extra cost for wheelchair users. Wheelchair users can rent a hand-controlled VW Polo from LeRo. Unfortunately, not all Titsa Tenerife public buses can accommodate wheelchair users. Thus, the newer buses generally are equipped with ramps. However, it is hard to predict which bus will run, so I wouldn’t opt for public buses to get around in Tenerife. The Tenerife Tram (Tranvia de Tenerife) connects Santa Cruz de Tenerife with La Laguna and is entirely wheelchair-accessible. If you wish to rent a shower chair, a mobility scooter or other mobility equipment (i. e. raised toilet seat, electric hoist, etc.) you have the choice between companies like LeRo, active Mobility Tenerife or Orange/Blue Badge Tenerife to only name a few. The popular, entirely wheelchair-accessible hotel Mar Y Sol in Los Cristianos is undoubtedly the most accessible hotel in Tenerife. I stayed there twice, in Summer 2008 and Spring 2009. It is true that the hotel is old and a bit run down. It is also important to know that the hotel is located on a steep hill above Los Cristianos. But it also offers two outdoor pools with pool lifts (one pool is constantly heated to 32ºC/89.6ºF), rooms with roll-in showers of different sizes, an accessible spa, accessible sports and more. Though this time we chose to stay at the Route Active Hotel in Los Realejos. The cute and modern hotel in the northern part of Tenerife has several, spacious wheelchair-accessible rooms with roll-in showers. Room rates come with a breakfast buffet that prepares you for the day. Tenerife has many wheelchair-accessible beaches. However, the most accessible and best-equipped beach is without a doubt Playa de las Vistas in Los Cristianos. A large wooden area with sunbeds, floating beach wheelchairs (Tiralo), an accessible shower, a transfer lift, and more awaits people with disabilities. A friendly crew is there to help if needed. There also is an accessible restroom that works with the EURO key. Another incredibly beautiful and accessible beach is Playa de las Teresitas. This beach is pretty close to Santa Cruz de Tenerife and lies in the eastern part of the island. Accessible beach paths, lots of handicap parking lots, access ramps, accessible restrooms, and showers await wheelchair users. However, I have no clue if they also provide floating beach chairs. After these accessibility basics continue reading about what you can see and do while visiting accessible Tenerife! You can’t come to Tenerife without seeing the stunning Teide volcano in Teide National Park. Mount Teide is the highest peak of Spain measuring 3.718 m (12,198 ft). 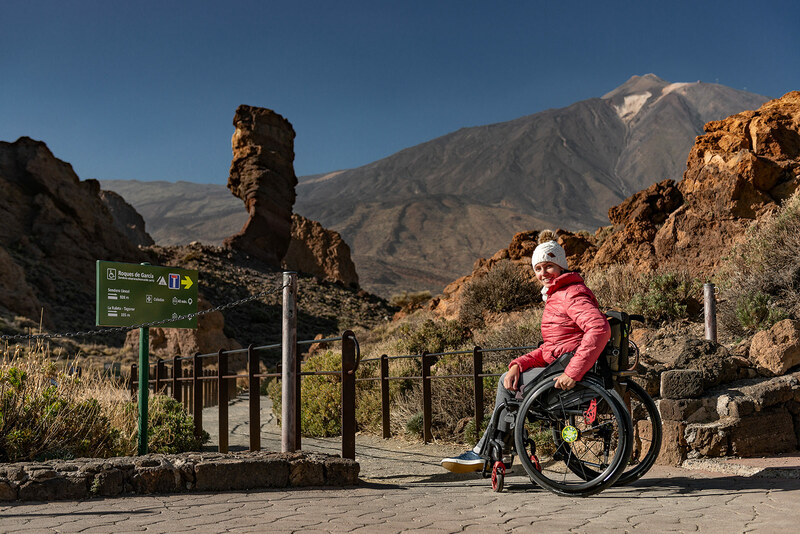 If you are a nature enthusiast like me, you will love the fact that Teide National Park is pretty wheelchair-accessible. Another advantage is that there is no entrance fee! The entirely accessible El Portillo Visitor Center gives a detailed overlook of how the volcanic ecosystem in Teide National Park works. A short, wheelchair-friendly path leads through the Botanical Garden to a spectacular Mount Teide lookout. Signs indicate the wheelchair route. While power wheelchair users will be fine, manual wheelchair users might need help for some moderate inclines. The packed gravel is okay to roll on. You also find wheelchair-accessible restrooms and handicap parking. Note that the Mount Teide Cablecar, unfortunately, is not wheelchair-accessible! However, there is an accessible restroom just behind the ticket booth. You have to ask the staff to unlock the restroom for you. Inside the Visitor Center, which is accessible thanks to an access ramp, you find a cozy and inexpensive café with spectacular views of the Roques de García. Handicap parking is available, too. If you have respiratory issues note that the altitude is 2.356 m (7,730 ft). Good news if you would like to take a closer look at the Roques de García, as there is a wheelchair-accessible trail longing the huge rock formations. The accessible and mostly flat trail leads to another fantastic Mount Teide viewpoint. In some parts, the fine gravel is slightly more profound than it should be, which means that manual wheelchair users might need help. Of course, there are handicap parking lots right in front of the trail. The closest accessible restrooms are inside the Paradores Café on the other side of the road. You can easily spend one or even two days in Teide National Park if you are, like me, interested in volcanoes and nature! Don’t forget to wear warm clothes as it can get freezingly cold up there (min. altitude of about 2000 m/6562 ft). The top of Mount Teide is usually covered in snow, however, this wasn’t the case during our visit in February. Loro Parque*, Spanish for ‘parrot park,’ is Europe’s biggest animal park located in Puerto de la Cruz. It is for sure the number one tourist attraction on Tenerife with millions of visitors each year. The wheelchair-friendly Loro Parque is world-famous for its extensive range of wild animals, including orcas and white tigers. You can easily spend the whole day exploring the beautifully landscaped zoo. Make sure to arrive before 10 am, especially on weekends, to avoid the crowds as long as possible. Note that there is no discount for people with disabilities and their companion. Regarding Loro Parque’s accessibility, there are some things you should know. First of all, the animal park is on hilly terrain, which means manual wheelchair users surely need a strong pusher. Secondly, the park is wide-spread, which might be important to know for people with limited mobility. However, to facilitate access, Loro Parque offers the possibility to rent manual wheelchairs free of charge. Visitors with disabilities also have the option to rent a mobility scooter. You need to inform Loro Parque 72 h in advance for a mobility scooter or wheelchair rental (click for details). There are several wheelchair-friendly restrooms throughout the park. All vary in size and equipment though and some don’t have an accessible sink. But at least the mobility scooter fitted in every restroom. I found the handicap restroom next to the flamingos to be the most accessible and spacious of all. Furthermore, there are designated sitting areas for wheelchair users and people with reduced mobility in each show theater. Handicap parking lots are available in the privately-managed underground car park. Another accessible trail awaits wheelchair users near La Laguna and Santa Cruz de Tenerife in the Anaga Rural Park. The ‘Path of the Senses’, a short wooden walkway of 300 m, leads through the peacefully quiet laurel forest of Anaga. You find handicap parking lots at the Cruz del Carmen Visitor Center and accessible restrooms at the Café La Gangochera. The ‘Mirador del Carmen’ lookout is wheelchair-accessible, thanks to a wooden access ramp. However, I found it difficult to maneuver due to the pretty bumpy cobblestone. The scenic road winding its way uphill to the Anaga Rural Park is already an experience in itself! I definitely recommend stopping at the accessible viewpoint ‘Mirador Jardin’ for dramatic views of Mount Teide and the cliffs. Icod de los Vinos lies in the north-western part of Tenerife, not too far from Puerto de la Cruz. The cute and historical village is home to the impressive ‘Drago Mílenario,’ the Millenary Dragon Tree. Unfortunately, the Drago Park itself is not wheelchair-accessible. My wheelchair got stuck on the cobblestone, which is in a bad shape as you can see on the pictures below. However, the accessible and free alternative is to look at the Drago Mílenario from Plaza Andrés de Lorenzo Cáceres. Just next to the plaza, in Calle San Sebastián, you find two handicap parking lots. Wheelchair-accessible toilets are inside Casa de los Cáceres, but there sadly is a step at the entrance. An access ramp isn’t available yet. Teno Rural Park is one of Tenerife’s most important and well-protected natural sites. It is located in the northwestern part of Tenerife and runs through the towns of Buenavista del Norte, Los Silos, El Tanque, and Santiago del Teide. If you are a fan of glorious and accessible scenery, this is your spot! The westernmost tip of the island is Punta de Teno, which is close to Buenavista del Norte. Impressive views of the Los Gigantes cliffs as well as stunning sunsets are guaranteed! The road that leads to Punta de Teno is one of the most stunning roads in all of Tenerife! While access to Punta de Teno is restricted for regular visitors from Thursday to Sunday and on public holidays (see details), persons with disabilities are always allowed to enter the scenic natural area. Another highlight in Teno Rural Park is the spectacular road TF-436 that leads from Buenavista del Norte to the tiny mountain hamlet Masca. The winding, narrow road is said to be one of the most scenic mountain roads in Europe. Two viewpoints on the way to Masca are wheelchair-accessible. The observation deck ‘Mirador Altos de Baracán’ awaits with terrific views of the Teno Mountains. Another accessible viewpoint is ‘Mirador de la Cruz de Hilda’ from where you see Masca in all its beauty. I recommend driving there as early as possible, as it can get extremely crowded. Unfortunately, there is no wheelchair-accessible restroom at the Café Mirador de la Cruz de Hilda. We also visited the wheelchair-accessible Ethnographic Park Pirámides de Güímar*. Just as you can guess, the Pyramids of Güímar are located in Güímar, a town about 60 km east of Los Cristianos. An ideal place for a trip, especially on cloudy days. The Ethnographic Park Pirámides de Güímar consists of a museum, an auditorium, accessible outdoor routes, the Tropicarium, and several gardens. Various exhibits inform about famous world explorer Thor Heyerdahl’s life and his archeological findings. However, the highlights of the park are undoubtedly the mysterious, terrace-shaped pyramids made of lava stones. The general wheelchair accessibility of Pirámides de Güímar is great. Manual wheelchair users might need help as there are some inclines throughout the park. Power wheelchair users will be perfectly fine. Handicap parking, as well as an accessible bathroom, are available. Santa Cruz de Tenerife is the capital city of Tenerife. One of the top sights is the Auditorium of Tenerife, which looks like a wave and which in some ways made me think of the Sydney Opera House. In Santa Cruz de Tenerife you find tons of shopping options. As I mentioned further above, the Tenerife Tram is fully wheelchair-accessible and takes you through the city. We actually wanted to visit the wheelchair-accessible Palmetum, a superb botanical garden with lots of palm trees, but it was unfortunately closed during the Tenerife Carnival. There are lots of handicap parking options for disabled visitors just next to the Palmetum and the Parque Marítimo César Manrique. From there it is only a short stroll to the Auditorium of Tenerife. The town of Candelaria, 17 km southwest of Santa Cruz de Tenerife, is a Catholic center of pilgrimage. It is mostly known for the eye-catching Basilica de Candelaria, which houses a statue of the Virgin Mary. There are numerous handicap parking lots at Parking del Muelle, where you also find the Tourist Information Center. It is good to know that the short way from the parking to the Basilica de Candelaria is flat in most parts. Right next to the basilica you can admire the majestic Statues of the Guanche Kings longing the sea promenade. The Guanches were the aboriginal inhabitants of Tenerife. I found Candelaria to be easily rollable. We also made a short stop in Santiago del Teide, a quiet and peaceful town in the western part of Tenerife Island. Handicap parking lots are available next to the Municipality Office in Calle de Placera. In the Municipality Office you also find restrooms, however, they aren’t wheelchair-accessible. My wheelchair hardly fitted inside and there was no space to transfer. As an alternative, wheelchair users can use the ones at the Hotel La Casona del Patio, a few meters down the main street. Santiago del Teide is a nice spot, although it isn’t the most wheelchair-friendly. Some of the sidewalks don’t have curb cuts and the restaurants we passed by weren’t accessible either. An undoubtedly stunning landmark that belongs to the Municipality of Santiago del Teide are the Los Gigantes cliffs. You can best see the gigantic rock formations from the wheelchair-accessible ‘Mirador Archipenque’ lookout. This spot comes with fantastic, unrestricted views of the Los Gigantes and even as far as to Punta de Teno. I recommend visiting the ‘Mirador Archipenque’ in the late afternoon. You also find a souvenir shop as well as a cute café with lots of food options as well as an accessible terrace. One of the prettiest towns of Tenerife is Garachico. Besides the fact that there is cobblestone in some areas, I found the ‘rollability’ to be quite good. You find handicap parking lots just next to the tourist office on the TF-42 road. As there aren’t any wheelchair-accessible restrooms, we had to use the ones at the Public Medical Center. Garachico surely was the dreamiest historic town we visited in all over Tenerife. Make sure to stop by if you can! For beautiful views of Garachico, I recommend driving to ‘Mirador El Lagarito’, also known as ‘Mirador Garachico’, on the TF-421 road. You see, there really is a lot to do for wheelchair users and people with reduced mobility in Tenerife! Have you already been to the island? Leave a comment below or send a message to share your travel experiences! And don’t forget to follow the LMT Blog on Facebook, Twitter, and Instagram! * Please note that Loro Parque and the Ethnographic Park Pirámides de Güímar invited me and my carer to visit their premises (entrance fees & mobility scooter at Loro Parque only). However, this courtesy does not influence or affect my judgment. All opinions are my own. I am neither affiliated nor do I receive any commission for this honest review. Thank you, Daniel! We loved Tenerife! Merci LMT & co pour ce magnifique voyage que vous nous offrez. Toutes vos descriptions des lieux et photos me donne envie d’y aller sans risque d’avoir des surprises d’inaccessibilité et ça c’est un énorme plus pour voyager tranquille avec un handicap. Thank you for your lovely comment, Karine! I am happy if my travel experiences help other people with disabilities. Merci Melanie pour vos descriptions si exhaustives Vous êtes davantage crédible que n’importe quelle agence de voyage! Je ne connais pas ce coin d’Europe mais je compte y aller bientôt ! Hello Leda! Thank you for your comment! Your message motivates me to continue sharing my accessible travel tips with the world! A few weeks ago a friend of mine told me about this other “wheelchair girl” (she follows on Instagram) who travels the world and blogs about her adventures. I have to admit, at first I really thought “Yah right, Instagram, probably another wannabe wheelchair model, entrepreneur… whatever”. Then, without checking the profile, I ended up forgetting about it. The thing is, last week I came across one of this girl’s photos (on Instagram!). I followed the link to her profile and realized she was the girl my friend had mentioned earlier. The profile was yours my dear Miss Turtle! I am happy to admit I was wrong and regret I didn’t check on your work earlier! You are doing a FANTASTIC job!!! Last year, my husband and I went to Gran Canaria. We sure did struggle while trying to find reliable and valuable accessibility information for our trip preparation. I just finished to read your incredibly long review on Tenerife and wow! I need to convince my husband to go back to the Canary Islands now (laughs). Anyhow, just stopped by to let you know that I am now officially one of your new followers, very much appreciative of the quality of all you do for the wheelchair community! The world needs more people like you to see we exist and that we have the right to travel (decently) too. Thank you.